This past weekend the DH took the guys out for a bike ride. They were back at the house in about 5 minutes. Why? Because my 6 year old couldn't keep up & got worn out. His older brother went back out with his Dad & he was very discouraged. I told him, chin up...let's go bake something! I had it in my mind I wanted to bake something that day anyway. It was rainy & cold. Perfect weather to turn the oven on. When they're both in the kitchen with me, there's always fights over who gets to measure this, who gets to pour this. So, every once in awhile, if I get the chance to cook with one of them alone, it's a nice treat. These muffins were the fruits of our labor. It was one of those times where I looked at what I had in the fridge...some fresh strawberries that had about a day left before they had to be eaten, a half a container of ricotta, which I didn't want to throw out. So, I thought...ricotta? strawberries? What could we make? Thankfully, Google is always available for instances like these & we found this recipe. 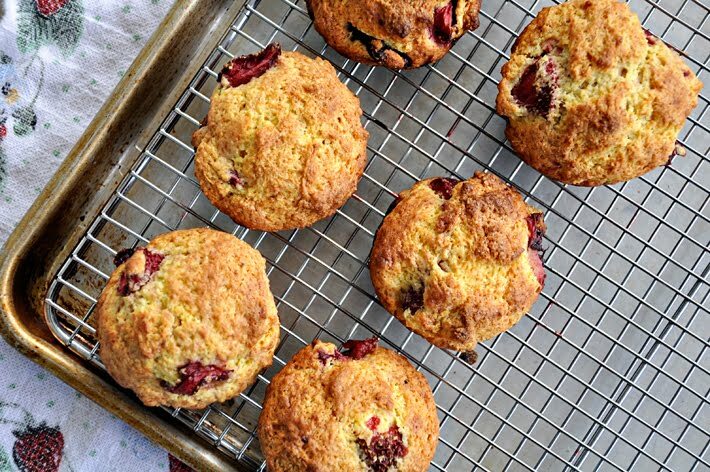 It's a variation on a Dorie Greenspan recipe, called Ricotta-Berry Muffins, in which she recommends using any berries you'd like, except strawberries...as they're too juicy. Begin by preheating the oven to 350 degrees. Brush the cups of a muffin tin with 1 tablespoon melted butter, set aside. Wash & hull 1 pound of strawberries. Cut them into halves, if medium sized...or quarters, if large, so that they're all relatively the same size. Lay them out on a wire rack, placed over a baking sheet & bake for 30-40 minutes, or until they are mostly dried. Remove from the oven & set aside to cool. Raise the oven temperature to 400 degrees. Meanwhile, melt a stick of butter, in a small saucepan & set aside to cool slightly. 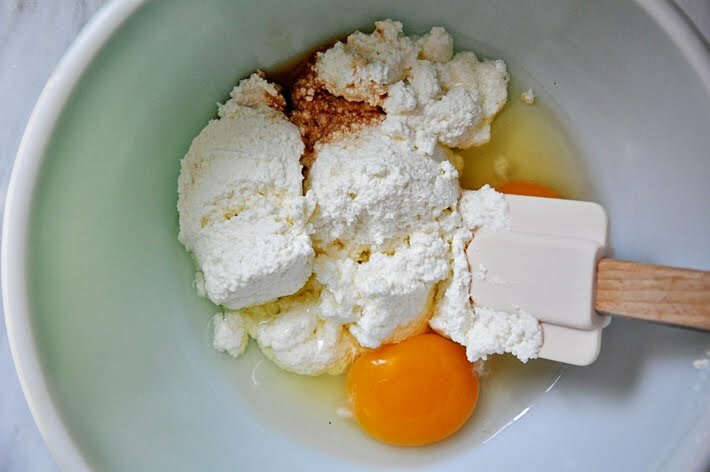 Add 3/4 cups ricotta, 2 large eggs & 1/2 teaspoon vanilla extract to a mixing bowl. Whisk to combine, then whisk in the melted butter. 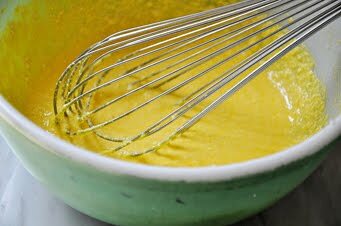 Note: My batter here is super yellow because I used fresh eggs from my Mom's chickens! To a separate, large mixing bowl, add 2/3 cups sugar & the grated zest of 1 lime. Using your fingers, rub the zest into the sugar, until the sugar is damp. This is the perfect task for the kiddos! 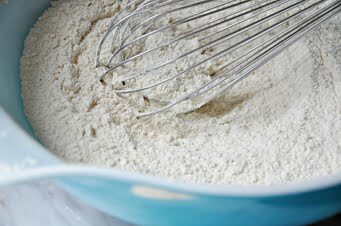 Add 2 cups flour, 2 teaspoons baking powder, 1 teaspoon kosher salt & a 1/4 teaspoon baking soda; whisk to combine. Pour the ricotta mixture into the dry ingredients & fold together, until just combined. Do not over mix! The texture will be more like a dough, than a batter & that's okay. You may need to get in there with your hands to get the ingredients properly incorporated. 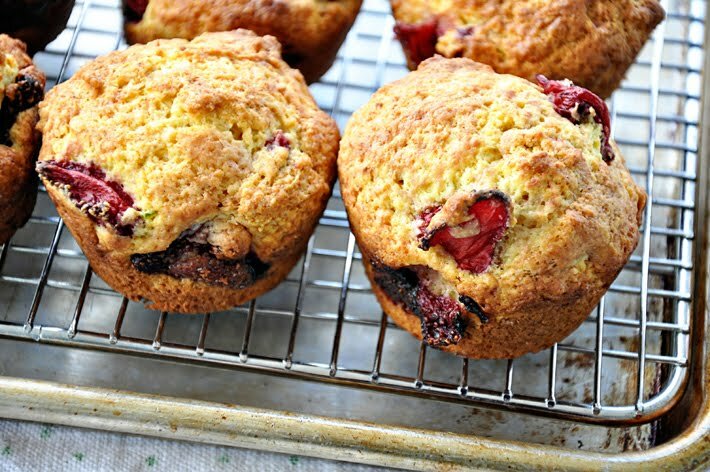 Stir in the strawberries & scoop the dough into the muffin tins, filling just to the top. This recipe is adapted twice. The original is from Baking with Julia, by Dorie Greenspan. The version I adapted was found here. 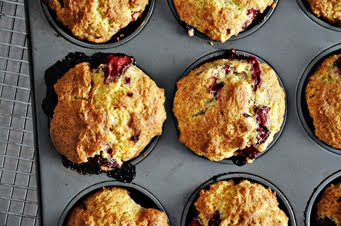 This recipe was originally called Ricotta-Berry Muffins, as any berry variety can be used. Using strawberries, however, was not advised, as they are too juicy. 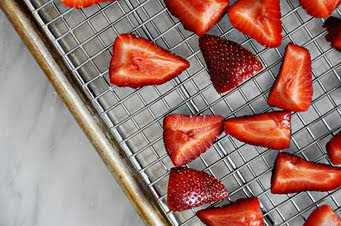 But, this version uses strawberries, with great success, as they are dehydrated first. 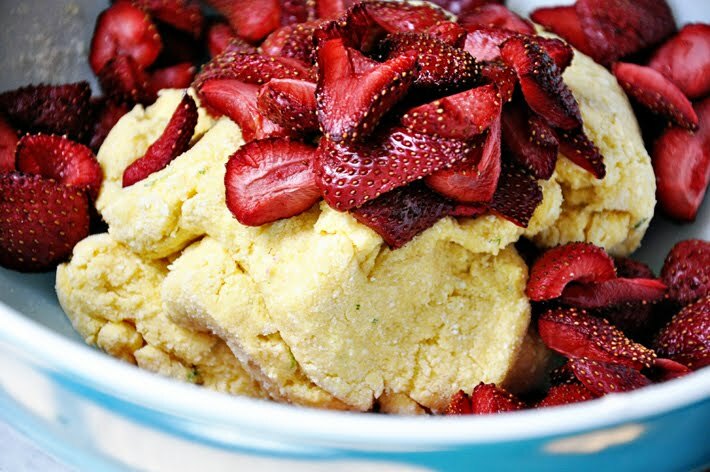 If you decide to use strawberries as well, do not skip this step! Preheat the oven to 350 degrees. Brush the cups of a muffin tin with 1 tablespoon melted butter, set aside. 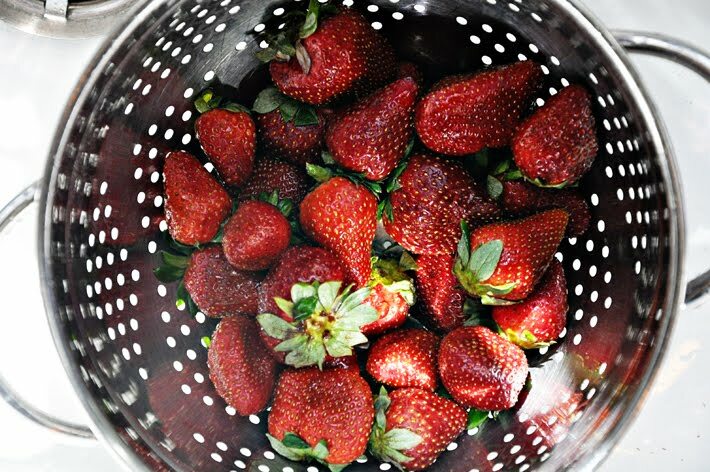 Wash & hull the strawberries. Cut them into halves, if medium or quarters, if large, so that they're all relatively the same size. Lay them out on a wire rack, placed over a baking sheet & bake for 30-40 minutes, or until they are mostly dried. Remove from the oven & set aside to cool. Raise the oven temperature to 400 degrees. Meanwhile, melt the stick of butter, in a small saucepan & set aside to cool slightly. 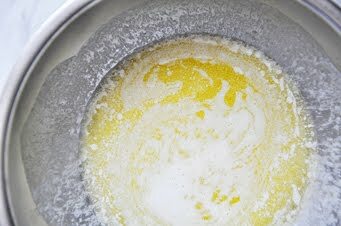 Add the ricotta, eggs & vanilla to a mixing bowl; whisk to combine. Whisk in the melted butter. To a separate, large mixing bowl, add the sugar & lime zest. 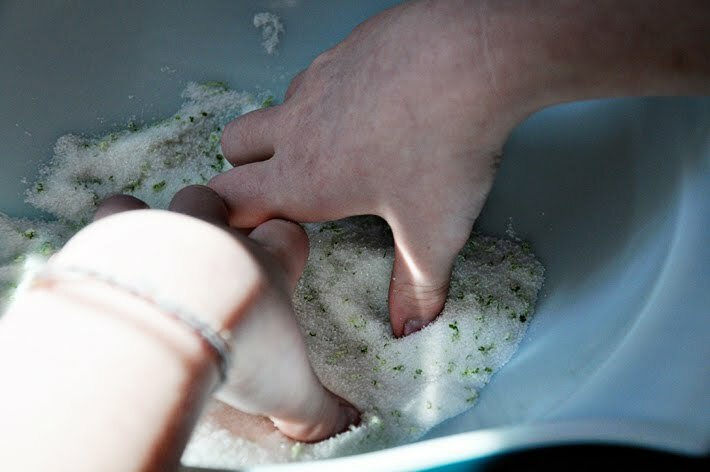 Using your fingers, rub the zest into the sugar, until the sugar is damp. 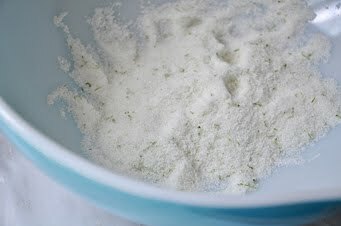 Add the flour, baking powder, salt & baking soda; whisk to combine. Pour the ricotta mixture into the dry ingredients & fold together, until just combined. Do not over mix! The texture will be more like a dough, than a batter & that's okay. You may need to get in there with your hands to get the ingredients properly incorporated. 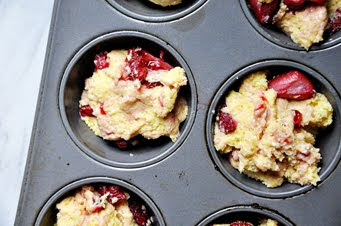 Stir in the strawberries & scoop the dough into the muffin tins, filling just to the top. Bake for about 25 minutes, or until the tops are golden brown & a toothpick inserted in the center comes out with just a few crumbs attached. Transfer to a wire rack to cool & serve. Note: These muffins are great right from the oven, but they can also be wrapped well & stored in the freezer for up to 3 months. Reheat in a 350 degree oven. wow so first of all I am AMAZED at the color of that batter! It is vibrant! In the most delicious way possible. These look like they tasted amazing! My first thought was "oh, no, she used strawberries!" but then I saw you dehydrated them, which was brilliant!! Alternatively I bet you could use strawberry preserves. Either way- yum! These days I crave for muffins a lot. I am not much of a sweet tooth you see! This is one of my fav muffin, fruit flavor .. i am guessing it will be overly sweet :) beautiful clicks as always! These look amazing! I just want to reach inside my computer and eat one! 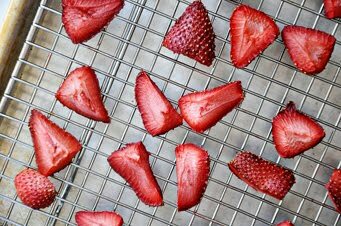 Love the idea of dehydrating the strawberries first to, makes a lot of sense! How many gramms are there in 1 butter stick? Just made these. Absolutely delicious!!! Mine were cooked in 20 min... 25 would have dried them out I think. Thanks! Love your blog!